Welcome to Mystic Empowerment cards. Spirit is striving to communicate with you. You only need to pay attention. 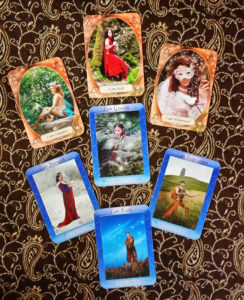 The cards of Empowerment series are able to communicate through visuals, words, and symbols with your unconscious self which is richly connected to Source. The cards you pull hold clues and answers that you simply need to take the time to decipher. The best way to do this is to become familiar with each of the cards and what they represent. Take the time to read the guidebook that comes with the cards, whether you have selected Mystic Bliss, Mystic Journey or Mystic Men of Magic (Mystic Magic for short) as it contains valuable information on the intention and energy of the individual decks and insights around the symbolism, suits, elements, compass points, archetypes and layers contained therein. There is no predetermined or set way to utilize this series. Intended to inspire through the power of the “I AM” statement often found in affirmations and other exercises, these cards may also be used simply as daily guides for mantras through the regular repetition of the messages. Regardless of the directions below, you are encouraged to do what feels right or what is in accordance with your existing divination practices relating to card use. There is no inherent magic within the cards themselves… only in your interpretation of the images and the words they contain. The “magic” to change and grow and release is already in you and is fully available if you simply allow. Be open to what comes to you as you use these cards and the natural purpose of these cards will reveal itself. Number 1 – Breathe… holding your breath is counter-intuitive… breathing is a natural thing and as such is part of the process of opening up. Be gentle with yourself and relax. Number 2 – Please note that it is “intention setting” not “expectation setting”… Be open to being honest with yourself about the reason for the reading you are intending to do at this time. Number 3 – Get centered… you may use crystals, music, symbols, chanting, and visualization to become centered. There is no “right” or “wrong”. This is a good time to invoke your guides and guardians. Number 4 – Ask a question… when you feel connected you may start by stating or holding your question in your mind and start shuffling. “What does being connected feel like?” It is unique for each of us so you may feel a tingling, a warmth or a slight pressure in your gut, heart or 3rd eye. Some people they feel vibrations in their body or their hands get hot. After a while, the feeling becomes familiar. You will know and recognize it more easily the more you pay attention. Accept it with gratitude. Everyone shuffles differently but splitting the deck in two and then blending the two piles together card-playing style, may not be gentle enough for the energy you wish to infuse in your process. You may choose to shuffle to a predetermined number of times and then turn up the top or bottom card to begin with. Alternatively, you may decide to use the “jumpers”, the cards that stick out or fall out, while you are shuffling. No matter which method you use, it is important to take your time, be patient and clear your thoughts of everything except your set question. That said, it is sometimes wise to throw caution to the wind, let your mind be busy and see what results you get. The Universe knows what the right information is for you and will present those cards regardless. Use your intuition when the cards reveal themselves and place them where it feels right. The number of cards that fall out or call to you is not important. Remember to stay open. Another method of shuffling involves placing the cards on the table top and mixing them up randomly. This is a valid method if your preferred way of selecting the cards for a reading is passing your hands over a spread to see which vibrate the strongest or feel different. There are many ways to lay out your cards. Trusting your intuition regardless of the different traditions and teaching surrounding layouts and spreads. In this section, I offer tips and ideas but place the cards down as you see fit. However, when several cards fall out together I do suggest you accept this as a message from Spirit and keep them together if that is what calls to you. Past Present and Future ~ By setting 3 cards down in a row you are choosing one card to represent where you have been, another for where you are currently and a third to point to what the future may hold. General spread ~ A general spread can be placing the cards in relation to the chakras in the body. Use your intuition to see where they “belong”. When I generate this kind of spread, I normally start at the heart or solar plexus and go up or down as it feels right. Sometimes, I extend the spread to the sides if more than one card seems to fit a particular chakra point. When I do this type of placement, I often see the “bridges” that are formed between the center cards because the cards placed beside them. Inverted Cards ~ Some traditions suggest that upside down cards mean the opposite of the main message. However, if you prefer more positive messages, for yourself or those for whom you are reading, you can choose instead to interpret inverted cards as having a message of particular importance which may require further contemplation. 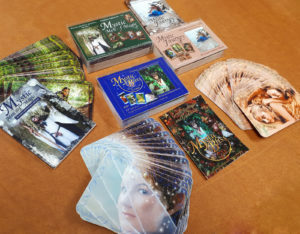 It suggests this method because ultimately, it is my desire to have the Mystic cards maintain as empowering and positive a message as possible. 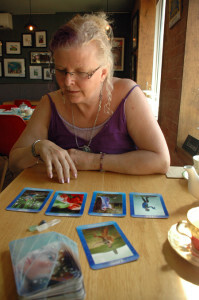 Why not try the idea a friend came up with and share as a way to fit card readings into her busy schedule? She found was getting frustrated with the “shelf help” stack of decks in her library since she often didn’t think to take one down and select a card. Her solution I think is brilliant! Open up one or more boxes of divination, oracle, angel, tarot or empowerment decks and drop the cards into a large container. Every time you are drawn to pull a card when passing your “treat” or “catch of the day” dish, you have them handy. Pulling a single card and meditating on it a few seconds is a powerful way to begin the opening process. For additional benefit, have the guidebooks that come with the decks handy and refer to the appropriate message page when time allows. So thrilled to have my set of Colette Mesdag’s Empowerment Cards. Colette is beautifully Devine driven and guided to make these cards. They are deep and full of details that one simply appreciates the more you look into each card. Colette’ readings are moving and powerful. I have experienced two over the years and without a doubt I come away feeling confirmed and inspired. Thank you Colette for your wonderfully beautiful self. You are a Christmas present and bubble bath. Can Mystic cards be used with other types of decks? Yes, if you have other decks that you already use or hope to get, you can easily integrate additional decks into any reading or routine. Personally, I have included angel cards, oracle decks, and even tarot material when doing personal readings for myself. Not so much so when doing readings for others however because my clients visit me for Empowerment readings specifically but I always have additional resources on hand for when the need arises especially various books and crystals. Trust your instincts is my advice. If you feel you need confirmation or clarity and you are drawn to use other decks I 100% endorse the blending of decks to maximize your access to the information trying to come through. How many cards do you recommend using when doing a reading for myself? A single card can be as powerful as a dozen when you are open and deeply connected to the cards you are using. 3 cards are a great place to start mind you when you are just beginning. No matter how many cards you use, it is important to allow yourself to absorb the information they provide. Trust the first thoughts that come to you when a card is revealed and consider how this information applies to you in your now. Start with one card and after considering it a moment see if it “feels” like another is needed then another… be patient with yourself as you are starting out with readings. Many great tutorials are available online about laying down cards and several card designers, such as myself, offer classes on using their cards effectively.